This house is being designed as a ‘down-sized, lock-up-and-leave, low-maintenance home’ so including a swimming pool in the plans hasn’t been an automatic decision. 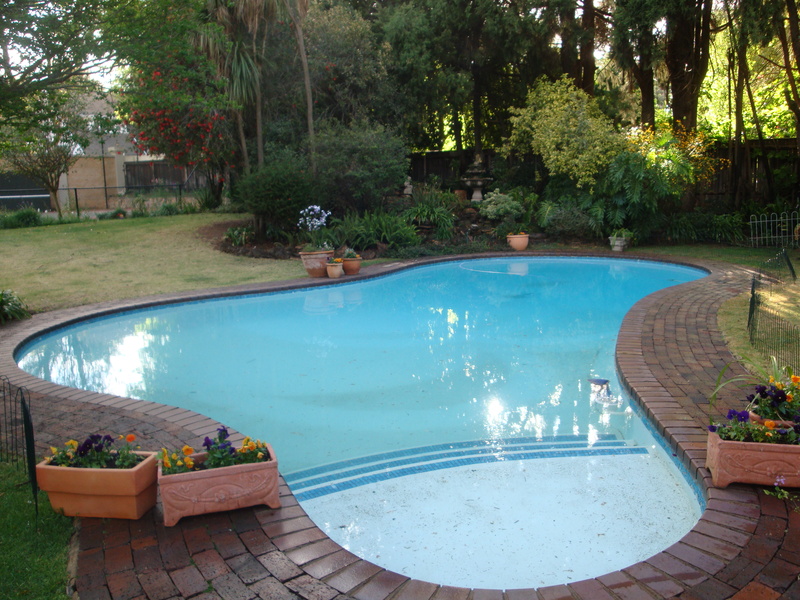 But when summer hits and the highveld sizzles, we know we’ll want one so the debate has moved on from whether or not to have a pool to what size and shape it should be. 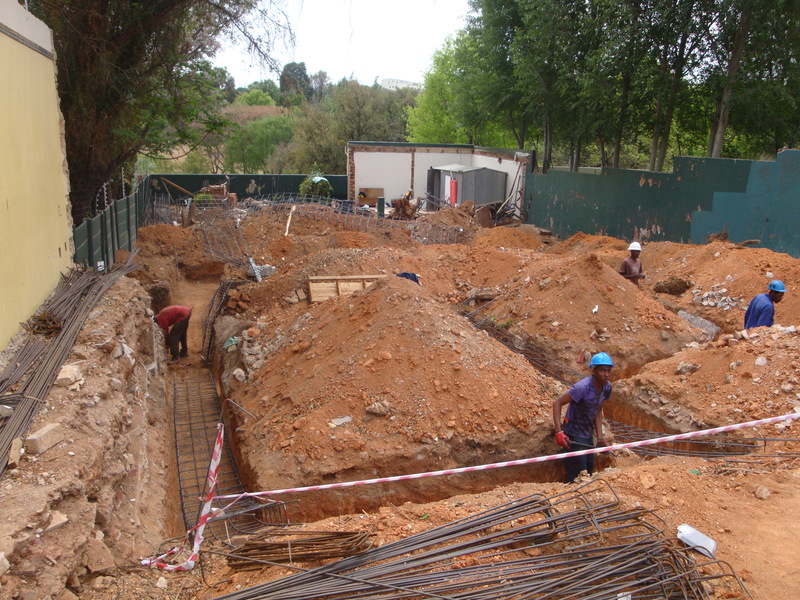 This will be our fourth home in Johannesburg and our fourth pool but it’s the first time we’ll be having one built. The others were already there. 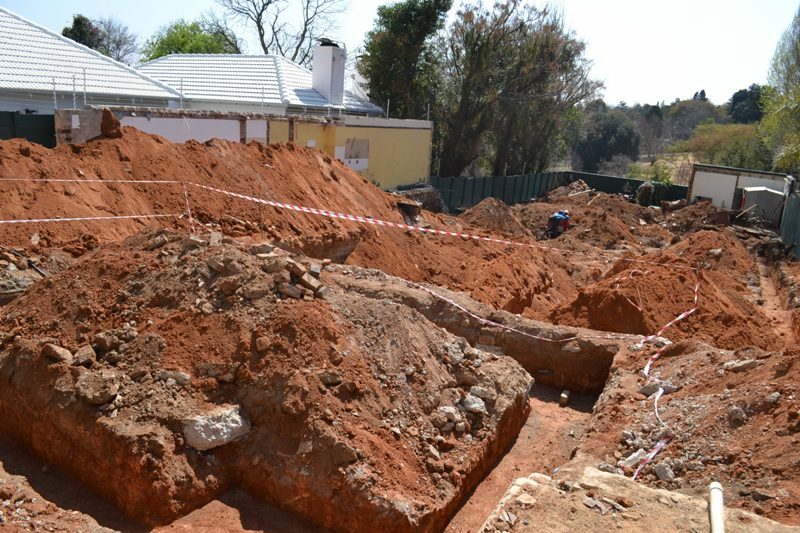 Although we have discussed the fact that it is probably best to do most of the pool construction while the rest of the building is underway, but, with the property still looking like little more than a bomb site, we haven’t up to now, given pool details too much thought. But now our contractor has asked us for specific plans as to the position and size of the pool and we are having to make some decisions. Here is a drawing showing the position of the house, garden and pool: The building closest to the street boundary is going to be the cottage which could be used either for guests or let out to tenants. The driveway can be seen on the left of the cottage, curving in to the next building which is the double garage. The garage is linked directly to the house via a scullery or ‘mud room’ which leads into the kitchen. The house itself, is set quite far forward on the site and the garden, coloured in green, is going to be small and – hopefully – manageable. We are taking the attitude that ball games to exercise dogs etc will take place in the park to which we’ll have direct access. After considerable thought, we’ve decided to run the pool along the width of the garden, at the bottom, rather than at right angles to the house as I like the idea of a stretch of unbroken lawn sloping very gradually towards the pool. Position of Pool and Garden in relation to the buildings. Agreeing on the position of the pool was easy. Agreeing on the style of the pool has been more interesting. The pool we have now. Probably build sometime in the 70ties. There are all sorts of interesting options available and we’ve narrowed them down to two: I am very taken with the idea and the look of pools that could almost double up as ponds, but it seems there is some hope that I might take to ‘proper’ swimming rather than simply cooling off and I have been persuaded to go the route of putting in a ‘lap pool’. I’m not making any promises and have actually managed to find a picture of a pool that could almost fill both briefs…. 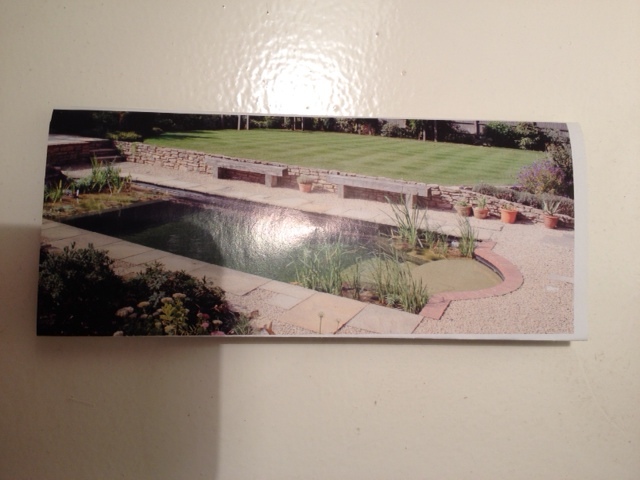 A lap pool with dark coloured lining. 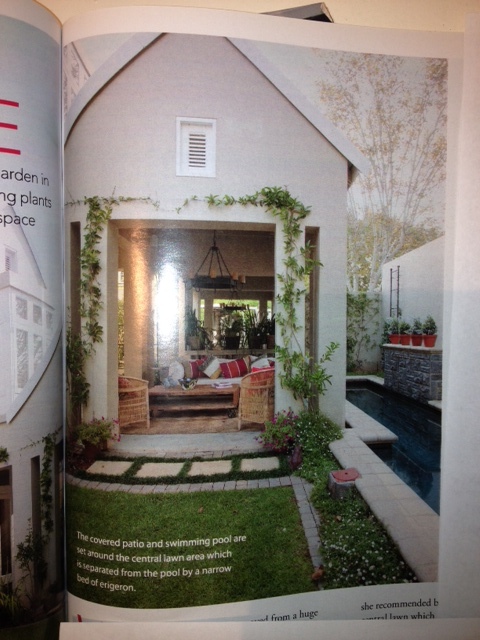 I particularly like the pool surround on this one. It has the look of a farm reservoir. Apparently 10m in length can suffice for a lap pool. We plan to make it only 2m wide with a cut-out bit where there’ll be a shallow step to sit on and which will also allow for getting in and out with a modicum of grace. 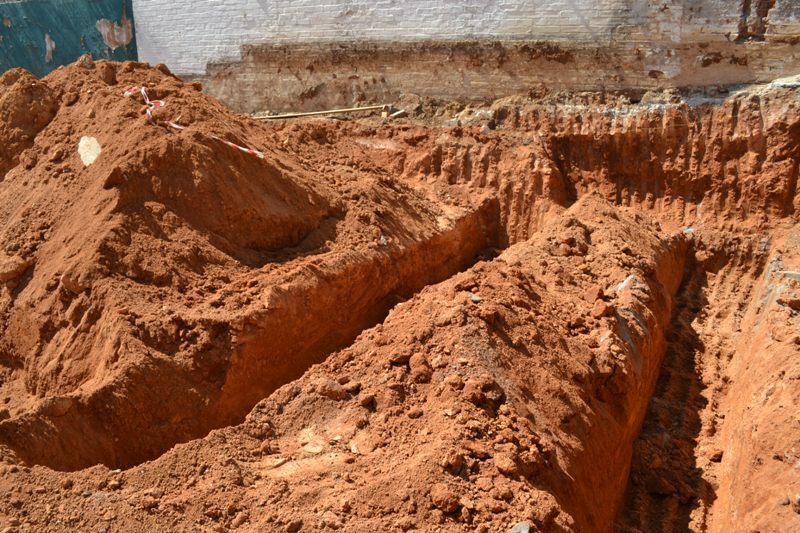 The foundations are dug but following a delay in the delivery of the reinforcing steel that needs to be put into the trenches before the concrete is poured, no wet work has happened as yet. This delay seems to me to have been unnecessary and we are still waiting for the Quantity Surveyor to give us a Work Schedule; something I plan to follow up on tomorrow. 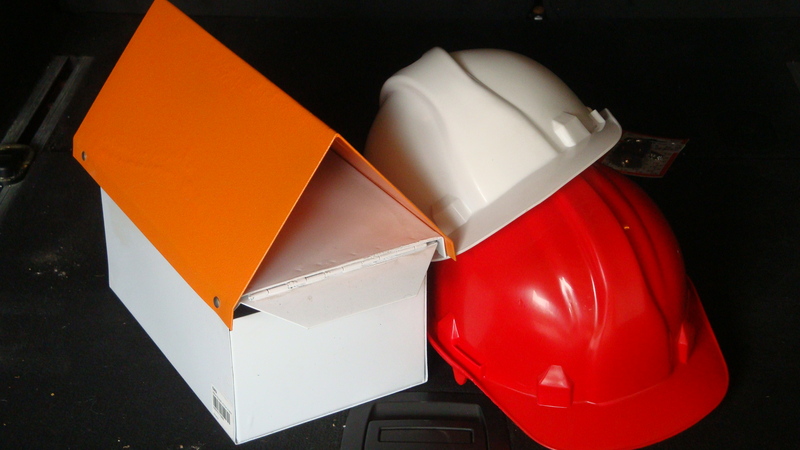 In the meantime, two hard hats have been purchased and have been travelling optimistically on the backseat of my car for the past two weeks. Looking at the site, I suspect it will be months before we really need to wear them. Bit by bit though, we’re getting more organised. After taking delivery of a few pieces of mail that had been delivered straight into a muddy puddle before being rescued, fortunately, by Thabo I bought a very basic letterbox which has been fixed to the old front gate. This is working quite well and when I visited on Friday, Thabo proudly presented me with a whole pile of dry, clean envelopes. Most of them are for the previous owners but at least when the council bills us for services, we’ll know about it. This is what things looked like on Friday. In the meantime the neighbours continue to surprise. Neighbour on the left is agitating about the boundary wall between our two properties. 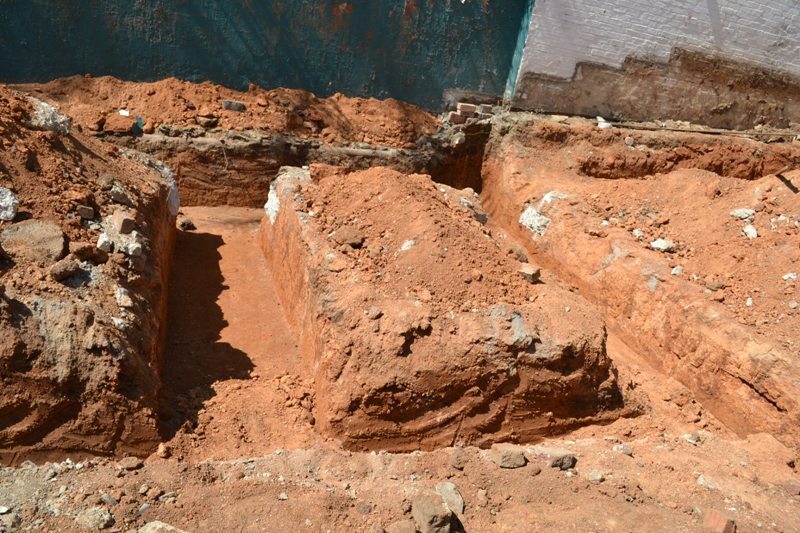 Our structural engineer has declared that part of the wall needs to be lowered as soon as possible: Excavations have shown that its foundations are completely inadequate and at its present height, it poses a danger to both her side and ours. We are meeting with fierce resistance but will need to act on this as soon as possible. And a week ago we heard through Bernard that our neighbour on the right had quietly and unexpectedly sold his house. I am disappointed as he has been charming and we were looking forward to living next door to him. When I visited our site on Friday, I saw him talking to someone on the pavement and decided it would be a good idea to introduce myself. I had only ever spoken to him on the phone up to then. Turned out he was talking to the new owner who hopes to move in before December. She was friendly and very happy to be able to put a ‘face’ to the building site she is going to have to live next door to for several months. I’m really surprised that anyone wanted to buy a house next to a building site still at such an early stage, but hopefully it says something about the desirability of that particular row of properties bordering on the park. We have exchanged numbers and I have said she is welcome to attend the next site meeting in case she has any particular concerns. We’ve started out well and hopefully we’ll be able to go forward in the same way. In London, a friend recommended that we visit The Building Centre. (www.buildingcentre.co.uk) We took the tube to Tottenham Court Road Station and found the Centre easily at 26 Store Street. Not quite sure what to expect, we were surprised to find a smallish exhibition centre, featuring great designs, 3-D models and providing interesting information on alternative energy sources. As you enter the building you are presented with a particularly interesting 1:1500 scale model of central London, showing all recent and proposed planning submissions. For anyone who enjoys models and miniatures, this is fascinating place to visit. 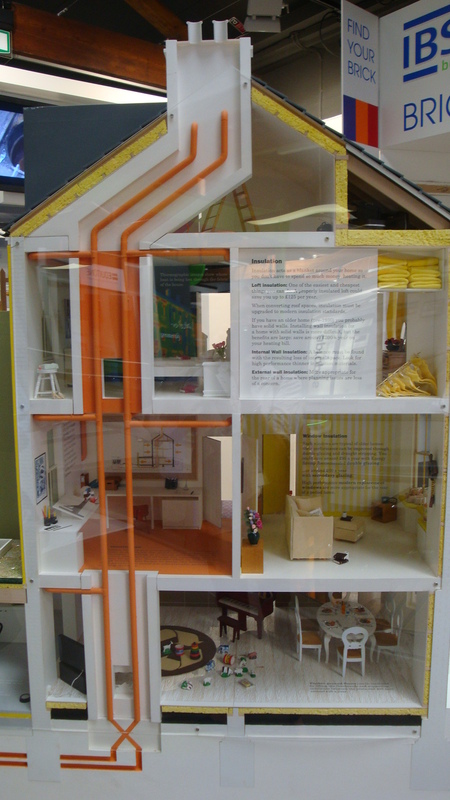 House model showing energy-efficient heating and plumbing options. 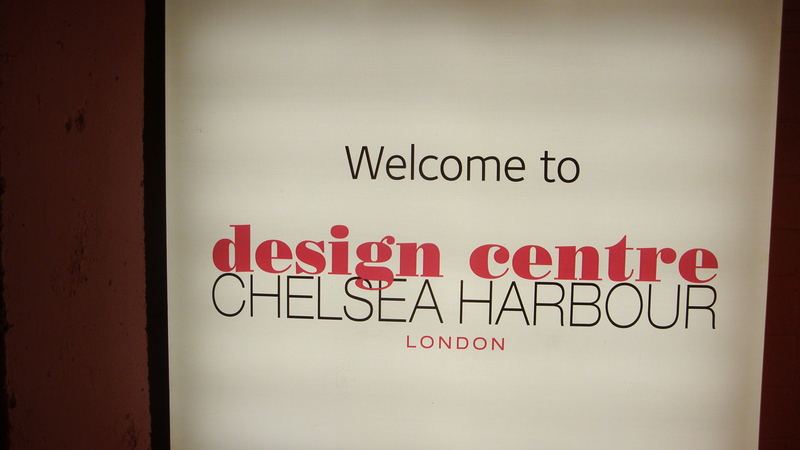 The Chelsea Harbour Design Centre (www.dcch.co.uk) is also a lovely place to spend a few hours – or more if you have the time to spend poring over thousands of fabrics. It’s a perfect place to visit on a rainy day with its spectacular glass domes allowing light to spill through the central atrium right down to the ground floor. The emphasis is on fabrics and soft furnishings but beautiful bathroom fittings, bespoke doors and several decor stores are also featured. 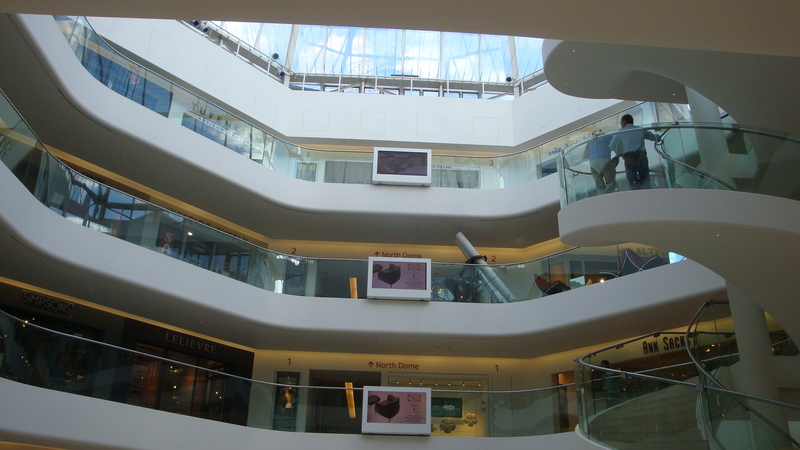 One of three linked atriums surrounded by showrooms and stores. 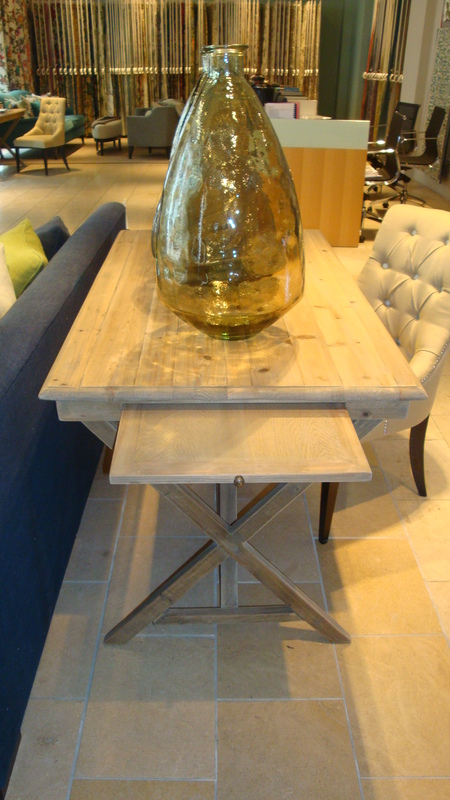 Loved this Nicholas Haslam trestle table. 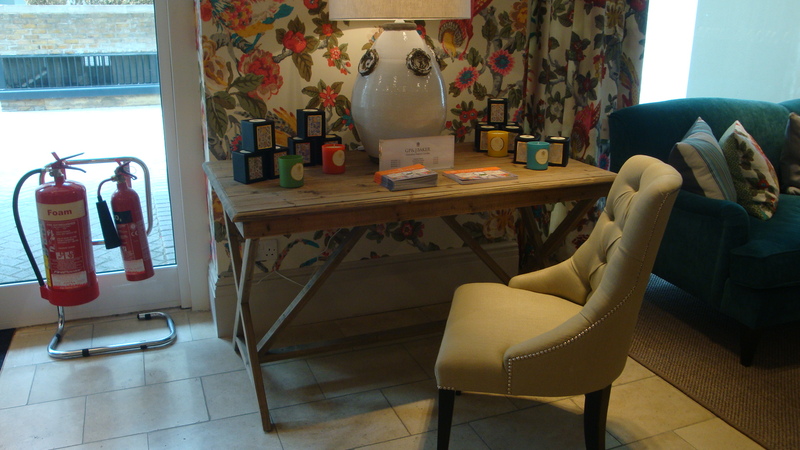 Beautiful Nicholas Haslam Oak table. My primary response to the Chelsea Design Centre was one of feeling quite overwhelmed by the vast array of products and options on display. It is a place that would require several return visits and probably a fairly specific focus before one could really come to grips with it. It’s worth a visit simply for the architecture of the building itself and must be absolutely spectacular when lit up at night. There is also a good coffee shop and an excellent RIBA bookshop stocked with every architectural and design book imaginable. I could have stayed there all day. 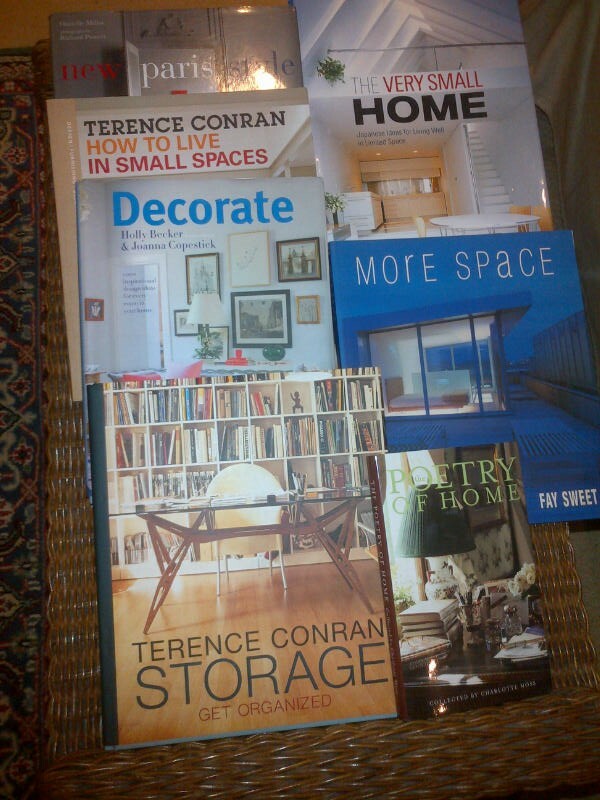 A tiny selection of books available in the RIBA (Royal Institute of British Architects) bookshop at the Chelsea Design Centre and part of my growing personal collection. Back in Johannesburg after five weeks away, it’s taking some time to settle into old rhythms and to get back into the building mindset. We arrived unannounced at a site meeting on Thursday and my initial reaction was one of mild disappointment that there was not more progress to be seen. We’d been on site three minutes when we were joined abruptly by an employee of our contracting company, who, without introducing himself, reprimanded us for not wearing hard hats and suggested that we remove ourselves from the site. We were too taken aback to respond for a minute and then introduced ourselves as the owners. 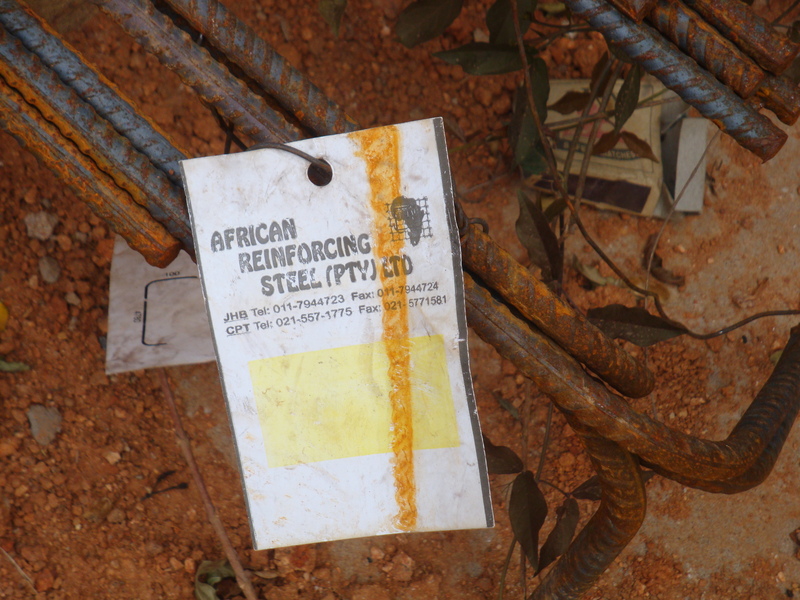 We pointed out that we had not been offered hard hats, that there did not appear to be any available for our use and furthermore that we were perched on the very edge of the site since there was nowhere to go without mountaineering equipment to navigate the high piles of red earth. We were hardly in a danger zone. The atmosphere shifted a little and hopefully we will be provided with the necessary hard hats shortly. Far from resisting wearing one, I’m delighted by the prospect. I’ve always wanted my own hard hat…. Watch this space. The red earth mountains were what contributed to my slight sense of disappointment as they both prevented us from exploring the site and obliterated the view of much of the progress. The foundations had been dug and many tons of earth removed from the site during our absence. Fortunately, on arriving at the site, I had experienced the same sense of ‘rightness’ about it. The outlook across the park is lovely, particularly with the trees taking on their fresh spring colours. At the meeting we were reminded that until we had signed the JBCC documents, the contractor was unable to pour foundation concrete. JBCC -Joint Builders Contracts Committee – have a website explaining their role in the control and supervision of building projects and it is important to have a contract signed at the start of the building process. The documents had not been ready for signature when we left for Europe at the end of July but they were signed this afternoon and hopefully the concrete-pouring will begin soon. In a nutshell, were anyone to ask me how things have gone so far, my response would that everything has taken at least twice as long as we initially expected. Starting with PHRAG and getting permission to demolish the original house, to getting the plans passed, progress has been laborious. 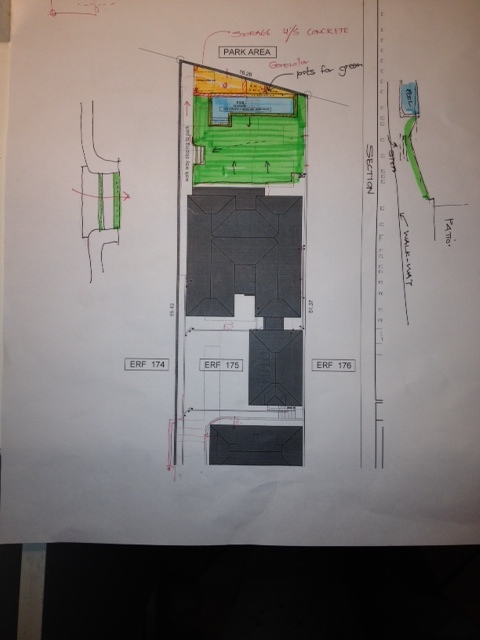 In the heart of Tuscany two weeks ago, we heard that our plans had finally been approved, stamped and released. We had expected to have them back in the first or second week of May. Despite using two “Plan Runners” who – for a fee – undertake to facilitate and hasten the progress of the plans through various divisions of the planning department, it was almost 4 months before we had them back. Other than adjusting the ceiling height of one room by a mere 200mm, there were no other design issues that needed to be addressed so the process does seem to have been surprisingly sluggish. However, hearing that they had been approved and passed was good news and went some way to offset the only other communication we received in Italy which was an email from our ‘neighbour on the left’, informing us that ‘the philistines had wrecked her pavement garden’ and that she was informing her lawyer of that fact. I continue to be intrigued that this person has apparently managed to renovate no fewer than twelve properties without causing even a minor inconvenience to anyone, ever. At Thursday’s site meeting there was no sign of any damage to the pavement garden which is looking remarkably pretty considering we have not yet come to the end of our winter. Moving on. We were told right at the beginning that the building process would take about a year and at this stage we feel we should only start counting from next week. That takes us to next September, about 9 months later than we thought when we originally bought the property. This also affects when we can confidently put our existing home on the market. We are bombarded by conflicting opinions by estate agents and even by friends as to what would be best. Above all, we want to avoid moving twice and having to spend time in rented accommodation. So right now, we feel we can only realistically market it early next year. I am bracing myself for the calls from agents who were told we’d be ready to sell from this month or next and I admit to finding this aspect of things quite unsettling. In the meantime, a drive around Parkhurst reveals other building projects apparently forging ahead at great speed and I am a little envious. One small stand that sold at about the same time we bought ours, now has a house built on it up to roof height. Needless to say, it was a level site with no previous building on it. Our contractor told us today that he hopes to get to roof height before the Xmas break this year. Originally we’d hoped to have the roof on before the rainy season starts, but at at this stage that might be asking too much. 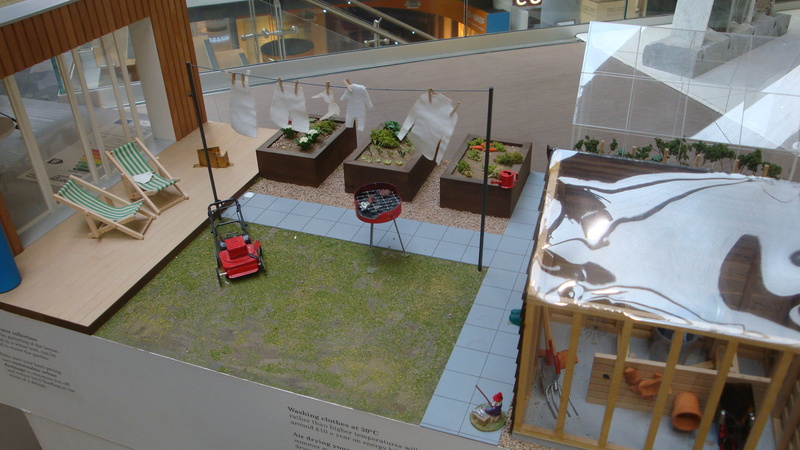 While away we did take the opportunity to visit a few building exhibitions in London although it was difficult to relate what we saw to our own project which still seemed to mired in bureaucracy. 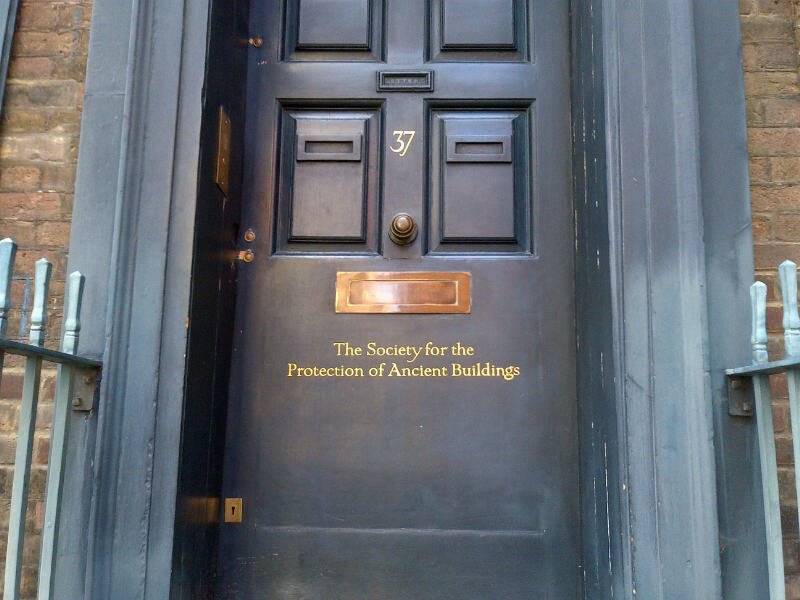 Some things bemused…..
London’s answer to PHRAG. I somehow don’t think 60 years would count for much. while overall the sheer choice of products is quite overwhelming. In the end, with the exception of one or two unusual features we might find abroad, we are likely to be perfectly content with the decor options we have available right here in South Africa. Our aim is to have a South African home in a South African environment and hopefully, when finally completed, it will both look and feel like one.